These past three weeks, our class has been entering into the heart of our digital history projects. For the “City Social Project”, as noted by previous posts, our class is digitizing US census data of various wards in Harrisburg. We are digitizing these records, which can be found on Ancestry.com, to showcase the people of Harrisburg and to help tell their stories and show their significance to the world. We have each been assigned two precincts, which are located within their respective districts, which themselves are within distinctive wards. Our jobs are to retrieve the data within the census records and key it into spreadsheets that we share with one another via Google Drive. For each name, we also transcribe information such as their marital status during that year, occupation, place of birth, and gender, among many others. Our goal is to record 1,000 names and their additional information from each of the two precincts we’ve been assigned. Although 2,000 names is no walk in the park, the long list of records we bring together as a class will help make information about this topic more readily accessible for a wide range of people, from civilians trying to learn about their ancestry, to historians or social scientists inquiring new theories that our data could support. In order to create a digital exhibit site in Omeka.net to display our research and findings of the “City Beautiful Movement”, we need actual records, artifacts, and other authentic primary sources. 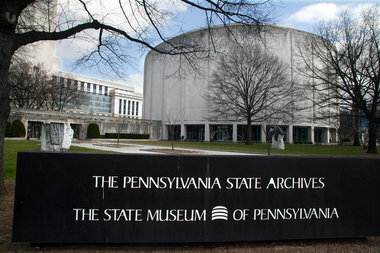 To gain these materials, our class has visited both the Pennsylvania State Archives and the Dauphin County Archives in Harrisburg. In each of these “historical temples” there are seemingly an unlimited amount of records and historical artifacts for researchers to sort through. So far, our sole visit to the State Archives was restricted to taking a simple tour of the building and being taught about its rules and ways to find information the quickest. However, at the Dauphin County Archives, those of us who visited were given the time to look through some boxes of records and books that we thought would pertain to our particular research areas. My group is focusing on the tangible improvements of the “City Beautiful Project”. So naturally, artifacts such as maps of the Harrisburg parks from the first decade of the 20th century and booklets of street improvements from the same time period are very useful sources of information. These types of things and more were discovered during a very brief time of less than two hours at the archives. One can only imagine the amount of information we’ll find when we increase the time spent there by ten fold. With the amount of data being digitized by our class, we will hopefully be paving a path of recognition for the city of Harrisburg and its “City Beautiful” movement in a way never done before.